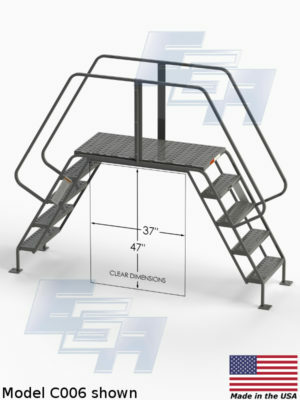 When safety matters, choose an industrial warehouse cross over work platform that won’t let you down. Dangerous or hazardous work environments are an oft overlooked necessity when a consumer buys a finished good. They are perils necessary to give Americans the standard of life they have come to expect. Whether it be live wires, rigid structures, or countless other hazards that trip up production, having a high-quality American made industrial cross over is a no-brainer. MADE IN USA – EGA Products is proud to make the material handling goods it sells — right here in America. In Wisconsin and North Carolina, some of the finest welders and wheelwrights in the world toil to make enduring industrial access structures.